LEGOLAND Discovery Centre at Chadstone is the ultimate indoor LEGO playground. 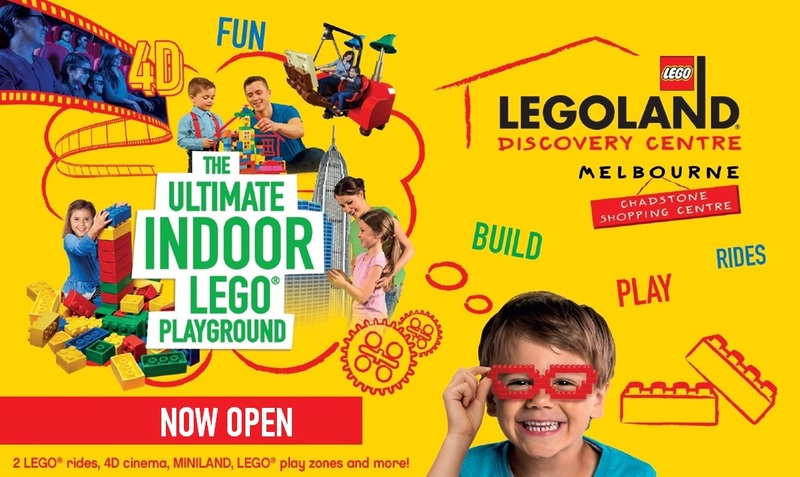 LEGOLAND Discovery Centre features two LEGO rides, five themed LEGO build and play zones, build classes from the Centre's Master Model Builder, a 4D cinema, special party rooms for birthdays and other celebrations, Melbourne's top landmarks recreated in LEGO bricks in MINILAND, plus more. Ideal for families with children aged 3-10, this is the perfect place to let your imagination run wild in a world of colour and creativity! The centre is first discovery centre in southern hemisphere for Lego, joining a global network of Lego Discovery Centres operated by British group Merlin Entertainment, including nine in North America, four in Europe and two in Japan. Not to be confused with traditional LEGOLAND Theme Parks, LEGOLAND Discovery Centres are essentially mini versions of LEGOLAND, usually containing a mix of indoor, outdoor and interactive attractions. over 2 million LEGO bricks under one roof! cinema, Kingdom Quest laser ride, Merlin's Apprentice, LEGO City: Forest Pursuit Driving School and more! One of a kind school trips. Bring the kids to Australia's premier LEGOLAND in Melbourne for build and play, a 4D cinema experience, and so much more!